The archaeological record sometimes throws up oddities that can’t easily be explained. From giant statues on Easter Island to the pyramids of ancient Egypt, these discoveries have often raised the question – ‘How could these possibly have been made by humans so long ago?’ The stone spheres of Costa Rica are definitely one of these mysteries. The stones were originally located across the Diquis Delta and on the Isla del Caño in Costa Rica. They were uncovered during the 1930’s when the United Fruit Company started searching for new areas to cultivate their banana trees. It’s estimated that there were around 300 petrospheres that varied in size from a few centimetres to over two meters in diameter. Many of these have subsequently be relocated. The largest petrospheres weigh around 15 tons and are classed as megaliths in their own right. Most of the stone spheres are made from a hard igneous rock known as granodiorite (Gabbro) although some have been shaped from both sandstone and limestone. Very few now remain in their original locations as most have been moved to private estates, museums and government buildings. What’s so mysterious about these Stone spheres? Well … nobody really knows why they were made and – more importantly – how they were made! 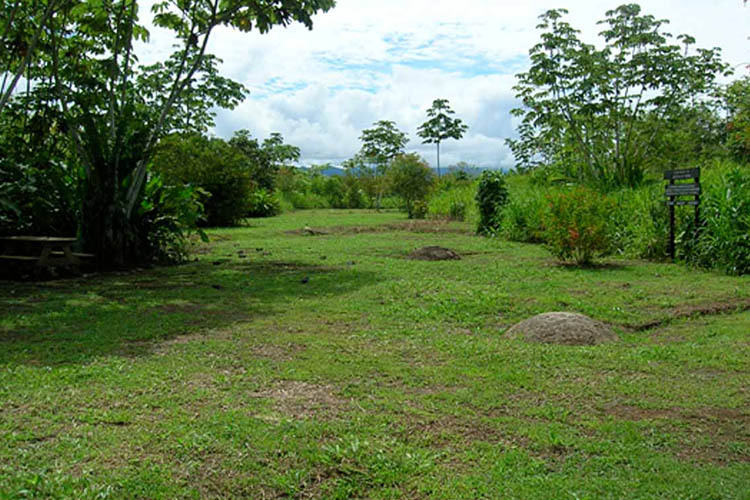 Stone Spheres of Costa Rica in their original environment – Farm 6 Archaeological Site. The stone spheres of Costa Rica have often been described as near perfect spheres and it is true that many of these objects are remarkably accurate. It’s also fair to say that they are not as precise as some excitable authors would have people believe. This has allowed debunkers to say that they have never been measured properly are not perfect spheres and that’s that. The truth is that many of the Costa Rican Spheres have achieved a level of accuracy that would be out of reach of a modern sculptor who had access to all the latest tools. In addition they have been measured many times. There is a well document account written by Eleanor Lothrop (1955) and published in Natural History Magazine. In addition, this account describes the spheres in their original locations before they were relocated over the following fifty years. Eleanor describes the lengths that her archaeologist husband – Dr. Samuel Lothrop of the Peabody Museum – developed in order to measure the spheres. In fact, quite a number of researchers just don’t believe that the pre-Columbian people of Costa Rica had the technology to achieve such works of precision. This could either be a huge insult to the abilities of these pre-Columbian people or it could be a realistic point of view that raises some extraordinary questions. 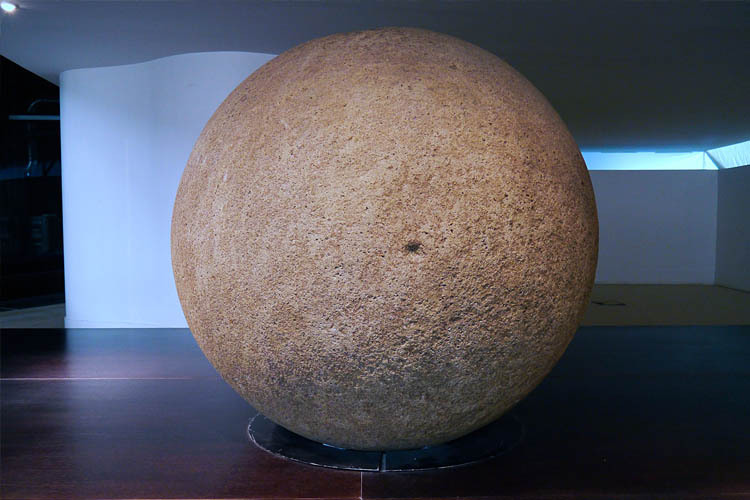 Stone sphere on display at the National Museum of Costa Rica. Who made the Stone Spheres of Costa Rica? It’s believed that the stone balls were made by the Aguas Buenas and Chiriquí cultures based on other materials such as pottery found with some of the spheres. These were native peoples ancestral to historical Chibchan-speaking groups of southern Costa Rica. Unfortunately, there is no corroborating evidence such a petroglyphs showing the making of these petrospheres. 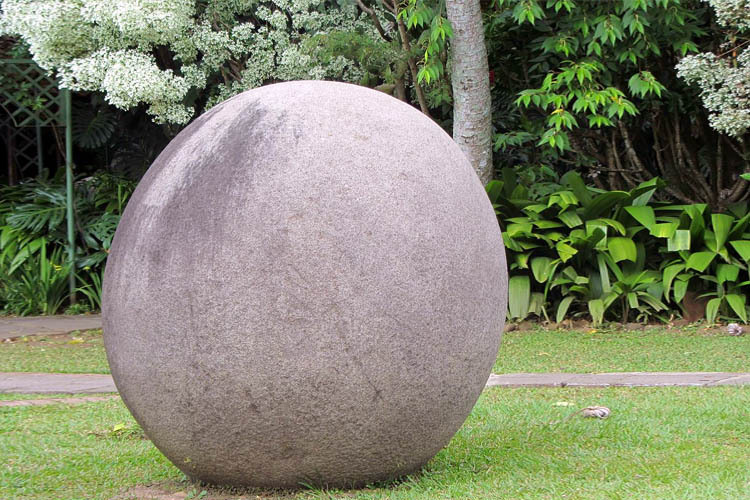 In short, there are no records of any kind that definitively prove who manufactured the stone spheres of Costa Rica. This absence of certainty has led many researchers to speculate that they could be of alien origin, from the lost city of Atlantis or even brought to Costa Rica through a time portal. Mainstream archaeologists are naturally very dismissive of these claims. What were the Stone Spheres of Costa Rica made for? Early studies of the stones including those undertaken by Samuel Lothrop quickly revealed that the stones had been set out in specific geometric patterns. The significance of these layouts has never been fully understood although there has been regular suggestions that they were linked to stellar constellations. Unfortunately, most of the stones have been relocated and confirmation of the original patterns and the scale of the stones in each location has now been lost forever. The assumption, as with Stonehenge and other megalithic sites, is that they were associated with religion. Some researchers believe they denoted status while others suggest that they were communal grave markers. The truth is simple – no one really knows. Stone Sphere from Costa Rica on display in the lobby of Musée du Quai Branly, Paris. How were the Stone Spheres of Costa Rica made? The theory is that they were made by first selecting a roughly spherical boulder. This was then heated to a high temperature and rapidly cooled causing layers of stone, from specific areas, to exfoliate. When repeated time and again the result was an even more perfect ball shape. The stones were then further improved by a process of pecking and hammering with stone hammers made of the same hard material. The traces of this process were then polished out using shaped wooden boards and ever finer grades of sand as an abrasive. However, while this seems to satisfy most archaeologists, there are a number of very big problems with this theory. The process would require vast amounts of wood – preferably charcoal – for the fires as well as complex manoeuvring of the larger stones. This would suggest a production centre of some kind. Also, the process would leave behind large amounts of debris such as exfoliated stone flakes, broken stone hammers, fire pits, rolling tracks and out of place deposits of used polishing sand. To the best of our knowledge not one single trace of this process has ever been discovered. In addition, the exfoliation process described in the theory often goes wrong. This would result in a large number of unfinished or damaged stones which would prove the how the process worked. No such damaged or unfinished spheres have ever been found either in situ or at the quarry located some 50 miles away. Finally, precise stone spheres are hard to form from natural rock. Perhaps this is the reason why spheres of this kind have only ever been found in Costa Rica with the exception of a few found in the highlands of Guatemala and in Vera Cruz. Even the ancient Egyptians, with all their experience of working with stone, shied away from making these objects. 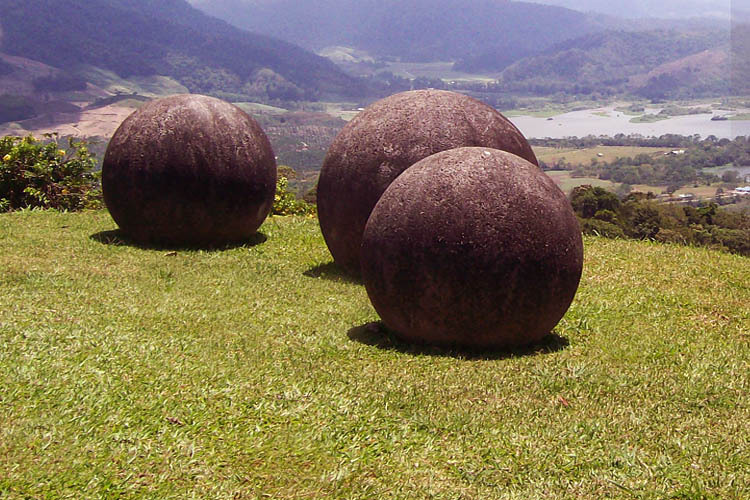 Stone spheres of Costa Rica on hillside overlooking the Reventazon river. The stone sphere are part of a network of megalithic monuments that can be found all over the world that were built by the Atlanteans before the collapse of their civilization. The stone sphere are part of a network of megalithic monuments created by an alien civilization and carefully position as message to humanity for when we are A) smart enough, B) civilised enough, to understand it. Many ancient monuments including some of the stone spheres of Costa Rica have been shown to have alignments with the stars. Some have theories that the ancient people of Costa Rica could make a solution of chemicals (a potion) that would temporarily soften the rocks thus allowing them to be more easily shaped. The tidal wave theory holds that the stones were from the bottom of the ocean or even an unknown civilization that we swept up by a giant tidal wave and deposited on the land. There is an ancient legend that the stone spheres are “Tara’s cannon balls”. Tara or Tlatchque, the god of thunder, used a giant blowpipe to shoot the balls at the gods of winds and hurricanes, in order to drive them out of Costa Rica. 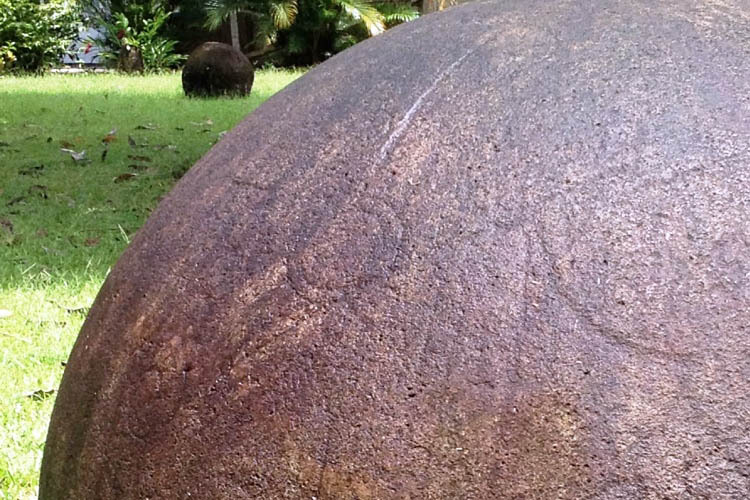 Stone sphere of Costa Rica showing potential tool marks from manufacture (Debated). For now it looks like the mystery of the Stone Spheres of Costa Rica will remain unsolved. Archaeologists think they know who made them and how but have no real proof. 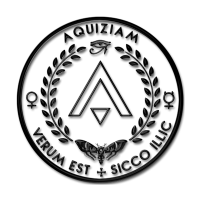 Alternative theorists believe they have the answers but, just like the archaeologists, they have no proof either. These petrospheres could be the proof of unknown or even alien civilisations or it could just be a load of old balls. You decide!